There’s something to be said for eating in a beautiful setting. This restaurant is richly appointed and comfortable. The red hues and wrought iron, soft chairs and softer light make it a place befitting a fine Italian restaurant. As far as looks go, this place can compete with anywhere I’ve been in Ventura County, or anywhere else for that matter. But looks only go so far, which is why I was relieved that the service, and the food, exceeded my expectations as well. I ate in the bar this evening, because it was happy hour and because I was assured they served the full menu. I sat down unannounced and was expecting to be ignored for at least a couple minutes. To my bitter disappointment, my waitress was taking my drink order in under a minute. In case you’re interested, I had a 20 oz Stella. The menu said that it came with a “Spicy Pepperonata sauce” which I was thinking would be more like a peppercorn sauce. It wasn’t. It was tomato based, but had a slight vinegar bend that was kind of reminiscent of hot wings. The chop was actually two chops. They were a little on the done side, which is fine by me. You can never be too careful with pork. 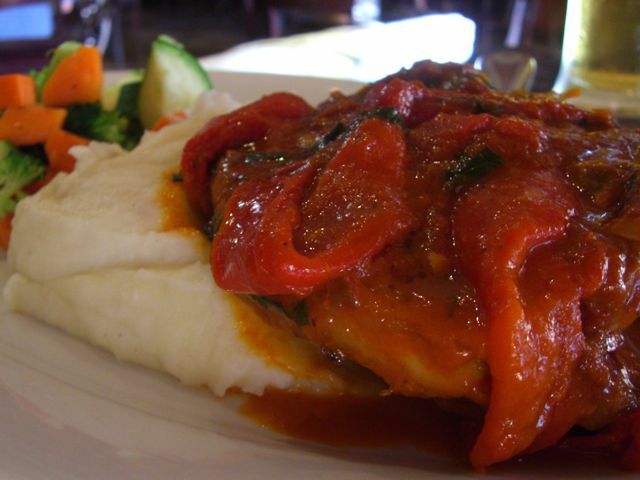 What really set the whole dish off was the red pepper in the sauce. If any of you have ever had the penne rustica at macaroni grill, you’ve had the absolute low end of the spectrum of red pepper. In fact, when I’ve eaten that dish in the past, I’ve pulled the pepper out of the dish rather than subject myself to the taste of it. The red pepper with my pork chop was absolutely sublime. It was sauteed to the perfect consistency and soaked up the spicy sauce like a sponge. It also had the added effect of giving some much needed moisture to the pork. Without the sauce, the dish would have been a flop. I was just as happy with the sides as I was with the main course. The mashed potatoes were whipped into an almost cloud-like state and tasted great with the chop. Also, the steamed vegetables (carrots, broccoli and squash) benefited from a good helping of butter and were cooked so perfectly that I couldn’t stop eating them. I wish I could make vegetables taste that good. After I had eaten my main course, I was introduced to Jerry, the owner. He asked me what I had eaten and when I told him the pork chop, he grimaced slightly. He then proceeded to let me know that the pork chop was probably the last thing he would have recommended because they are still fine tuning it. Hey, at least he’s honest. Plus, if that’s the worst thing on the menu, then I will definitely be going back, frequently. I was told that the lamb chops are outstanding and next time I choose to fall of the vegan bandwagon, I’ll have to give them a try. Since I have been good this week, I decided to take my server’s suggestion and get dessert. I normally don’t. She told me that the creme brulee was her favorite and I suddenly lost the ability to say no. Lucky for me it was pretty outstanding. 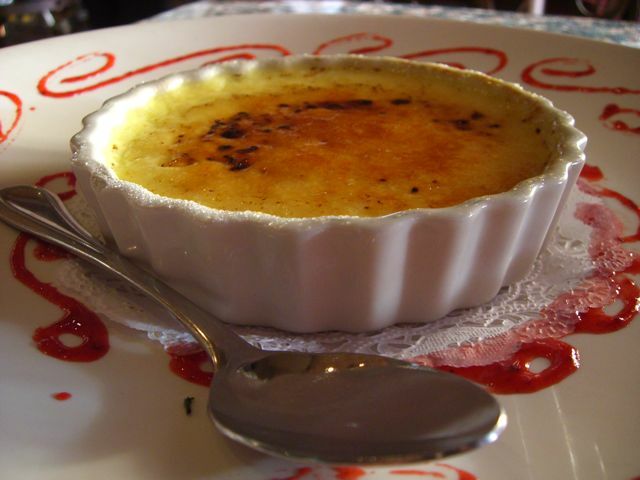 Aside from looking the part, this creme brulee accomplished something that most others don’t. The sugar on top was more than just a garnish. I hate it when places don’t give you enough. This was the perfect thickness and was like having thin rock candy with the light creamy brulee. It was pretty rich, so I’d recommend that you share it because I only made it about 1/2 way through. Still, it was worth every penny. Aside from the great food, friendly service and great atmosphere, Fiamme also boasts live music on Thursday, Friday and Saturday. The guys who play have a very James Taylor-esqe sound, which is very relaxing. The other awesome thing about Fiamme, for us foodies at least, is that they are still relatively unknown. You can get a great table on a weekend night almost as soon as you walk in. I don’t know about you, but I despite waiting. In fact, unless I have a good recommendation from a trusted friend, I usually won’t wait at all. I’m confident that this will change soon, so you guys should check them out before the word gets out. 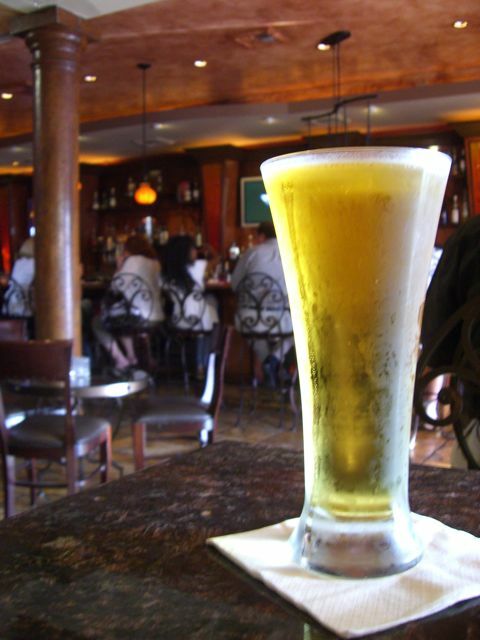 For the just out of work crowd, they have happy hour weekdays from 4-7, with $5 appetizers and drink specials. 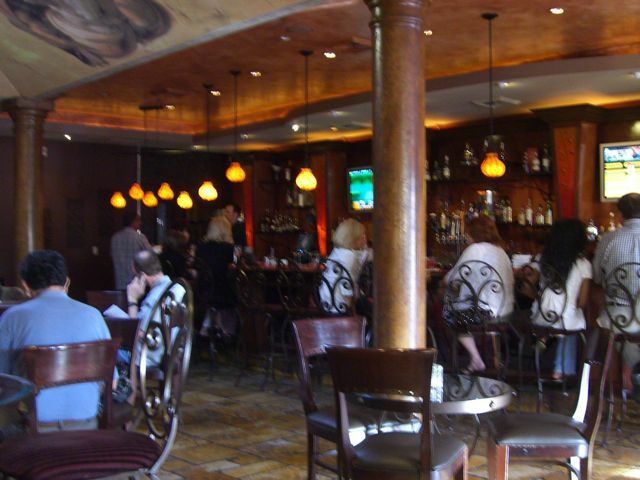 The bar has a ton of space, big comfy couches and cool wrought iron barstools and high top tables. Because this is the couple behind The Melting Pot, just a few doors down, it’s only a matter of time before Fiamme becomes a local favorite. I’d like to say a special thank you to Esto and Nicole. You made your restaurant feel like home to me. So, readers, next time you’re looking for Italian food with a little something extra, give Fiamme a try. I promise that you won’t go home hungry. I’m actually very content at the moment. Mikey and I are taking little T to the Strawberry Festival tomorrow, so be on the lookout for that post later this week. We’ve got some good stuff on the horizon. Thanks for reading, we’ll try to keep doing good work for ya. So glad you liked it! Thanks for trying it out. I am a regular and think it is one of the best restaurants in the area. Have fun at the Strawberry Festival. You are the reason I went, so thanks for that. I told you we’d make it out, but I’m sorry it took me a little longer than expected. Still, I’m happy to add another good Italian restaurant to my site and even happier that it’s in Thousand Oaks. We need more good Italian! Hey, I know it’s not food, but I am working on a really amazing community project to bring the traveling Vietnam Wall Memorial to Westlake Village (the only California location this year) over Labor Day. We need sponsors and volunteers. If you could email me, perhaps I can send you information and you can help spread the word. I am at info@corridorcomms.com. I enjoyed reading your blog today. I’ve actually eaten at Fiamme many times already and have enjoyed everything I’ve tried–you can’t go wrong! Next time you go, you should try out their racing simulator. It’s so much fun!